Our approach to competition is a positive one. We motivate, encourage and educate dancers in a positive environment. We believe that performance plays a developmental role in a dance education. It provides students opportunities to showcase their achievements and motivates them to reach their full potential. 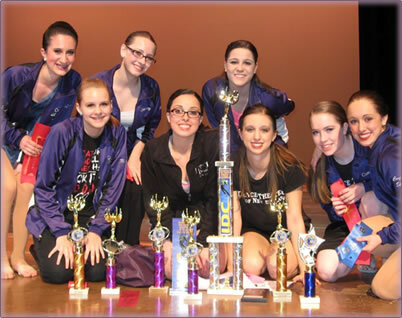 Being on a competitive dance team requires commitment and sportsmanship, but is extremely rewarding! Since its inception, Dance Theater of New England’s Dance Company has emerged as a leader in technical excellence and artistic athleticism. Whether on the competition circuit, the concert stage or recital venue, our Company Dancers have wowed audiences all across New England. Dance Theater of New England Company members participate in competitive, charitable and concert dance events all across New England. We’ve taken top awards at StarQuest, Starbound, IDC, Headliners, American Dance Awards, Showstoppers, Bravo, Turn It Up Dance Challenge, and Step Up to Dance competitions. Company dancers are required to be enrolled in two or more Ballet classes each week and dance at least one week in our Summer Intensive Program. Interested in dancing for DTNE? Join us at our summer intenstive for consideration!